Directed and produced by Steve Chernoski, Hockey in the USA – Part I asks the simple question: what can hockey do to become more popular in the United States? In the documentary, Steve travels from Washington, DC, to Portland, ME, in an effort to answer that question. As you watch, think about how you might answer. What does the hockey landscape look like in your area? What are people doing to help develop a love for the game in your community? And most importantly, is there anything that we as individuals can do to help hockey grow in America? After the film is done, join in the conversation in the comments below. Steve’s first documentary, New Jersey: the Movie, is on sale here: http://www.neoflix.com/store/CKP86. So what can each of us do to grow the game? I don’t think this question suggests we need to start a youth league, or organize a tournament, or beg our local pro teams for assistance. But start small. 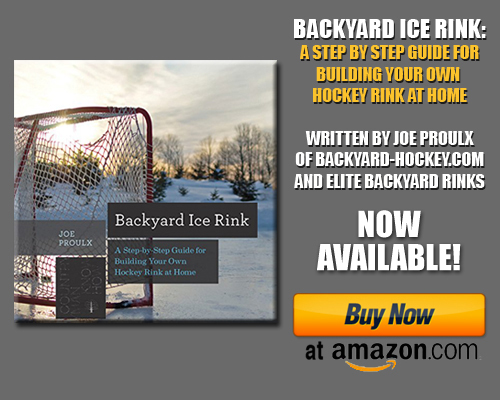 Backyard rinkbuilders: invite the neighbors for a skating party. Hockey parents: donate your children’s used equipment to people you know who would benefit from a cheaper, easier entry into the sport. There are little things that each of us can do that will affect the game in our immediate circles. Most are cheap or free. So what will you do? I think many people including parents stay away from getting their kids involved in hockey because the price of the equipment, practice times at the rink can be very late or very early and like said in the video for general fans the puck is hard to follow. Many people may not understand the strategy of the game also. A lot of times, I think its the dislike of the sport from the parents end and not wanting their kids to like the sport. I agree with Joe, exposure of the game in small simple areas help. Backyard rinks to bring neighborhoods together and donation drives of old equipment for kids to try out the game for little cost. Once the kid falls in love with the game its hard for the parents to turn that down. After being an active hockey player through my childhood and into college, I will continue promote the game and effect the people in my network as much as I can. Thanks for posting Joe. I do feel that more involvement from pro teams is an answer, for instance with my town of Ewing, it’s just smart marketing. Devils’ co-owner Jeff Vanderbeek spent this summer going around to New Jersey towns to try and grow the Devils brand, notably in some southern areas of the state where more people have historically been Flyers’ fans (look at the apparel of my coach and former teammate). The Devils moved into Trenton, changed the ECHL team name from the Titans to the Trenton Devils, to try and more hotly contest the divided county that is Mercer. But sources in Newark and Trenton have told me the Devils’ bottom line is about player development. They’re marketing has just amped up recently from when Vanderbeek & Gilfillan took over. What would I like to see? Similar involvement from what the Bears do in Hershey by the NJ or Trenton Devils in my hometown and surrounding communities. I don’t think it’s fanciful. Finally, (changing topic) I would also like to see a retro hockey convention (maybe based around a pond tournmanet) similar to comi-con. We can dream can’t we? Mullets, moustaches & wooden sticks. first, great documentary. enjoyed it from start to finish. seeing the footage of the USA/Canada final, when Parise tied the game brought me back immediately to that very moment in my own living room. we all exploded out of our seats. the 2010 olympics was some of the best hockey I’ve seen in years, and really put the NHL on ice product to shame. I’ve been a new york rangers fan my whole life, but watching guys like Parise, Ryan Miller, Ryan malone; guys who you grow to despise over the years of watching them play for rival teams, and then seeing them play along side Ryan Callahan, and Chris drury, and getting to see other players who play on the west coast who you dont normally get to see like Ryan Kesler, jack (mf’n) johnson, or dustin brown, and you get to appreciate these players, and become fans of these players. Parise is still in jersey, and will probably psend his whole career there, and hes going to score a lot of goals against my rangers, but I have a newfound respect and admiration for him as a hockey player, and when 2014 rolls around, he will be one of our heroes again. I was honestly depressed when the olympic hockey was over. I had to go back to watching my rangers struggle to score 2 goals. the over expanded salary capped NHL has resulted in a diluted talent pool. i dont think the NHL will ever contract, but i would love to see the league go back to 24 teams, or even 26. Just watched your documentary.Great job. I’m 55, live in Western Massachusetts and started watching hockey as a 15 yr old because football season was over, baseball hadn’t started and I stumbled on it one Sunday afternoon.I fell in love w/game watching Eddie Giacomin and Rangers on WOR. Hockey had just taken off in the Berkshires right around this time when Bruins won the Cup in ’70. Unfortunately I never had the opportunity to play until I was 35. Best thing I ever did .I have been running a local beer league team out of a local tavern since ’92 and have been taking a team to a spring tournament in Connecticut in April since then. There’s quite a large group of adults ranging in age from their 20’s – 50’s playing on teams in our part of the county. Unfortunately the youth and high school hockey programs in the area have had dwindling numbers in the past decade or so. Our high school teams are no longer competitive w/teams in the eastern part of Massachusetts. We were discussing this in the sponsor’s bar one night and came to the conclusion that we’ll probably be the last generation of adult league players. In 20 yrs or so there will be not enough adults to carry on the beer leagues unless something changes at the youth level . That’s sad to think about . Great documentary. In my opinion, I think hockey will have a difficult time building up a large “national” base due to the lack of playing exposure for our youth. I grew up in Southern Indiana which stays too warm in the winter to support frozen ponds/lakes for more than a few days throughout the entire winter. The closest ice rink was more than an hour away so I didn’t get that exposure either. We must get our youth involved to really grow the sport long-term. How many passionate fans of baseball have never thrown a baseball or picked up a bat? The same question can be asked for basketball, football, etc. It wasn’t until I moved to Michigan, that I developed a passion for hockey. What has really sparked my passion is the fact that the town I live in has a local ice rink that I skate at on my lunch break 3 or 4 times a week. My passion has grown this winter into building a backyard rink for myself and my 3 year old to skate and slap the puck around on. While I have this luxury, the vast majority of the United States does not. This again leads back to my initial point of Americans not having the ability to get involved in the sport due to climate and lack of ice rinks in the US. Before we worry about the price of equipment, etc., the focus has to be on more people in America having access to ice. This is a huge advantage for Canada as most of the country has frozen lakes/ponds multiple months every year. If we can first solve the accessibility issue, then I think the focus should turn to the fact that 40% of young players quit, the price of equipment keeps players away, etc., etc., etc. Loved the documentary. Ice hockey is expensive to play (hundreds of $ for a short season + hundreds of $ for equipment). I think that’s the main reason why it isn’t as popular as football, baseball, etc. So how do you remedy this? Well – the NHL could sponsor the construction of deck hockey rinks all over the nation and host NHL sanctioned deck hockey leagues with playoffs, etc. It’s a cheaper alternative than ice-hockey and it will introduce a ton of kids to the game, thus creating a new era of fans. Plus, they can promote NHL events at the rinks. I am just starting out and my biggest problem is cost of gear and the actual team sign ups… The cheapest i can get gear for is 200 plus 800 for sign ups. that’s $1000 just for a season. Then if i like the sport i have to dump another 200-1000 to get better gear.